myDavy is the easy way to access your Davy account online, helping you view and manage all of your investments in one place. I would like to access my Davy account(s) online via myDavy and request Davy to send me a username and password. By registering for access to myDavy, you are also agreeing to receive your account correspondence online for your accounts. We will send you an alert by email to let you know when you have new correspondence, so you don't miss any important correspondence. For further information please refer to the Terms and Conditions for your account. This registration form is for accounts in your name only. For joint accounts please click here. For corporate accounts, entities or any other queries in relation to adding accounts please call 01 6148900. Your email address(es) will be used for password reset and for alerts. For additional security purposes, an authentication code will be sent to your mobile phone(s) by SMS each time you log into your account, including joint accounts other than online trading accounts. For joint online trading accounts only the primary mobile number given will be used. This authentication code must be used in addition to your username and password before you can access myDavy. Online correspondence includes contract notes, valuations, client asset statements, tax packs and other correspondence as it becomes available online in place of paper copies by post. If you want to receive paper copies in the future you can change this setting in your profile within myDavy or by contacting Davy. 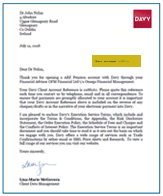 You received your account number by letter when you opened your account with Davy initially.